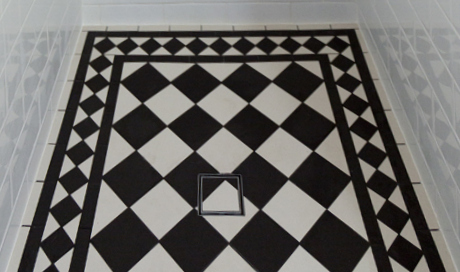 As each floor tile was individually installed, our company needed to work closely with the client to ensure the correct quantity of black and white floor and border tiles. 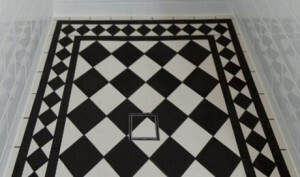 Of special note are the tile-insert floor wastes in each shower – each tile was cut by hand and carefully installed in and around the floor waste unit to ensure the diagonal black-and-white floor tile pattern continued uninterrupted. The matching black and white consoles in the bathroom and ensuite feature elegant swan tapware sets, and exposed plumbing beneath the units was cleverly concealed with chrome sleeves. 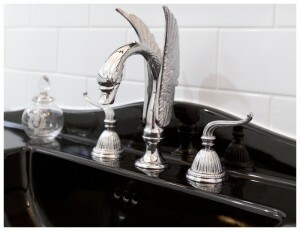 Traditional-themed accessories such as robe hooks, glass shelves and towel racks in a chrome finish complemented the tapware. Belinda could not be happier with her new bathroom, ensuite, water closet and laundry, and we are very proud to show it off on her behalf! To view more pictures of these beautiful bathrooms, as well as other projects carried out by Brisbane Bathroom Renovations, please visit our beautiful bathroom gallery. If you have a bathroom vision you would like to make a reality, contact us now for a personalized on-site measure and quote with one of our bathroom specialists.